Today is day seventeen of my three week trip in the North Atlantic, and having been to Shetland, the Faroes and now Iceland in that time it’s absolutely flown by (although I haven’t, I’ve got the ferry between all these places so far). 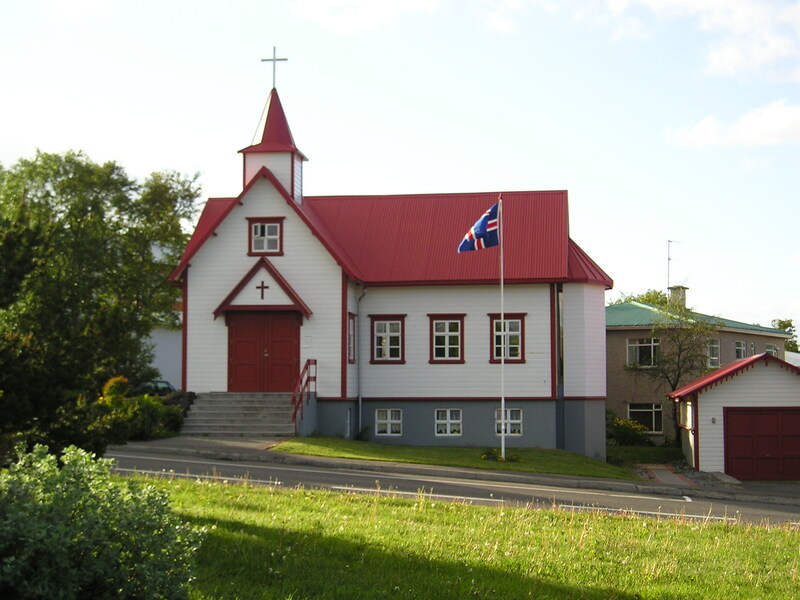 I start the day with a visit to Nonnahús, the home of Reverend Jón Sveinsson (better known as Nonni) who was an Icelandic children’s writer and very much a celebrated local hero by all accounts. The house was billed as a good example of a 19th century Icelandic dwelling, and it certainly had a historic feel to it, and very small bedrooms upstairs. I was struck by the amount of wood used – wasn’t this supposed to be a treeless country? I guess this is where all the wood went! Although I think a reasonable amount of driftwood was probably used to. 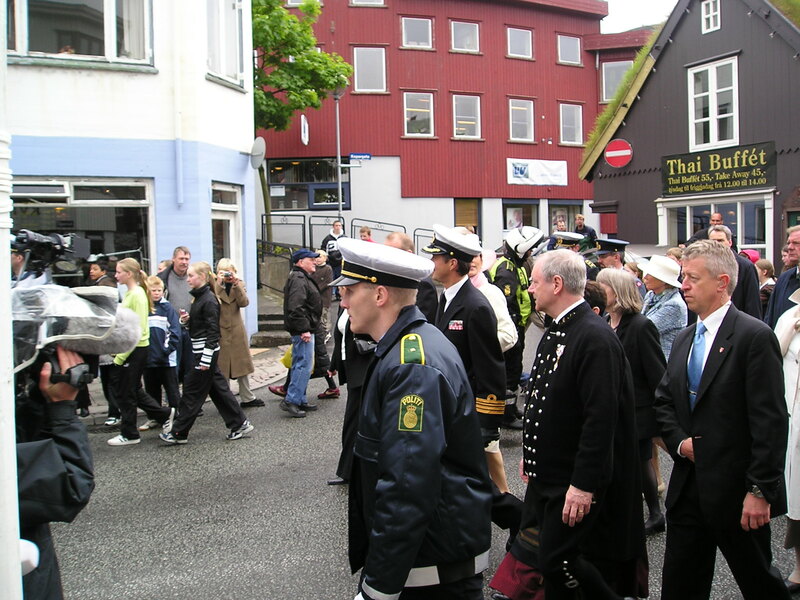 The entrance ticket to Nonnahús included entry to Minjasafnið á Akureyri, the Akureyri folk museum. This consisted of lots of old toys and musical instruments, and loads of photos. 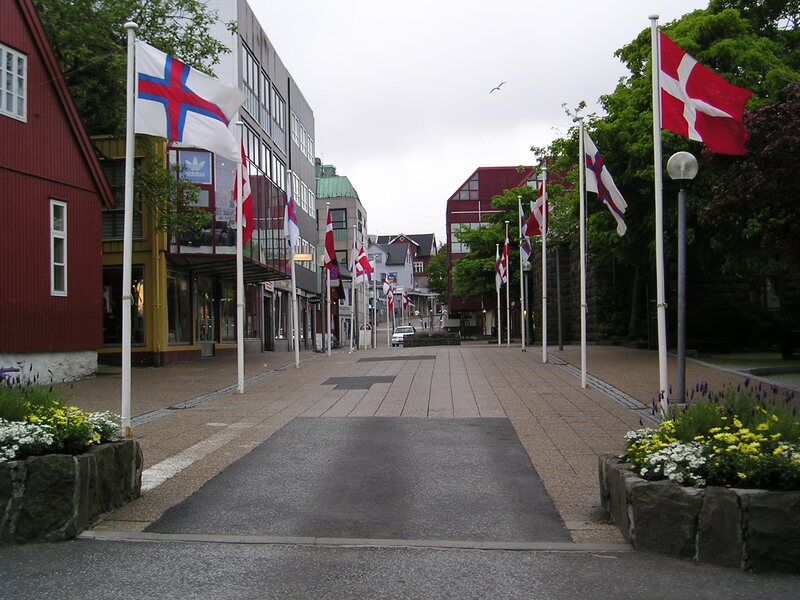 I popped in at the library to use the internet and catch up with emails, quite an impressive library for a town of its size, bigger than the library in Torshavn. 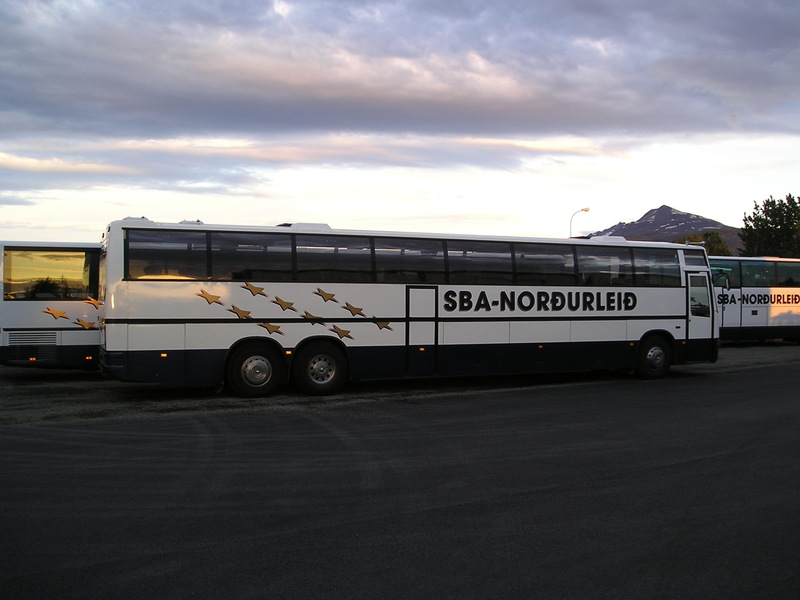 In the evening I was keen to sample the Akureyri nightlife, but was left disappointed. I had a pint in Cafe Karoline, which only had about five other people in. Afterwards I tried and failed to find somewhere more lively. I think I’d read somewhere that Akureyri claims to have more strip clubs per capita than anywhere else in Europe (it had five I think) – not that I was particularly after this but it did imply there might be a decent nightlife but if there was I couldn’t find it. The one bus a day from Reykjahlíð on Lake Mývatn to Akureyri didn’t leave until 3:30, and I felt like I’d done everything with a reasonable walking/cycling distance so it meant I had a leisurely morning, and long lie in. When I got on the bus there was one local and about five or six tourists on it. It’s amazing there’s a service at all really it must be subsidised quite heavily. When the bus pulled into Akureyri it was a bit of a shock to the system to be back in an urban environment – although it’s still quite a modest sized town at around 17000 people, it’s the largest in Iceland outside the Reykjavik area, and the largest town I’d been in since leaving Aberdeen on the ferry about two weeks ago. 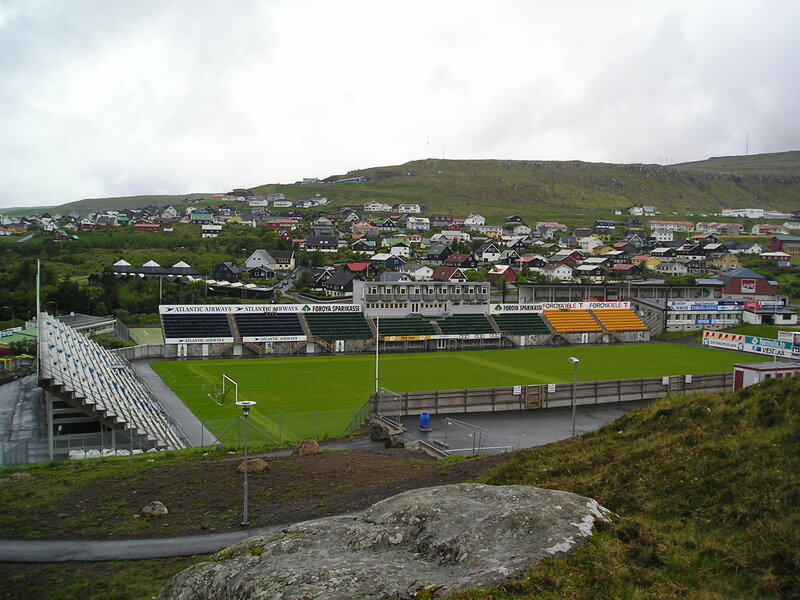 I had heard from a guy at the campsite in Reykjahlíð that the campsite in Akureyri was shut – but I checked with the tourist office and thankfully it had just reopened. It did have a slightly unfinished feel to it though – and no showers! Despite this is was packed, full of huge Icelandic off road vehicles, caravans and camper vans. On my way into town I stopped at the botanical gardens – taking an avid interest in all things arctic I was keen to see the arctic flora of which they apparently had a lot – but was pretty disappointed. Just a modest collection of low lying shrubs with small green leaves. Still what exactly did I expect? It’s not really a region known for it’s flora afterall. 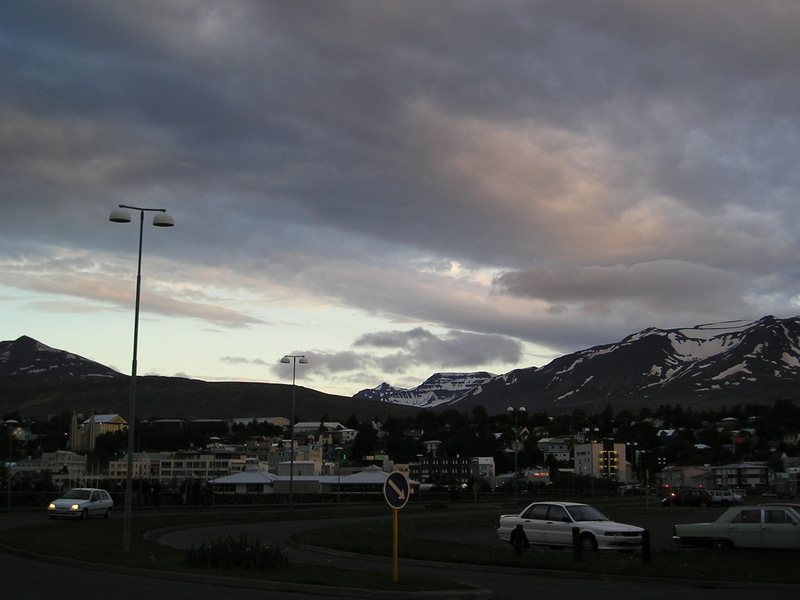 Akureyri town centre was pretty quiet – but then it was a Sunday night. A handful of tourist shops were open selling the usual postcards, t shirts, puffin keyrings and hugely expensive books on Iceland. A couple of pubs were also open but they all looked dead so I thought I’d leave the nightlife for tomorrow. 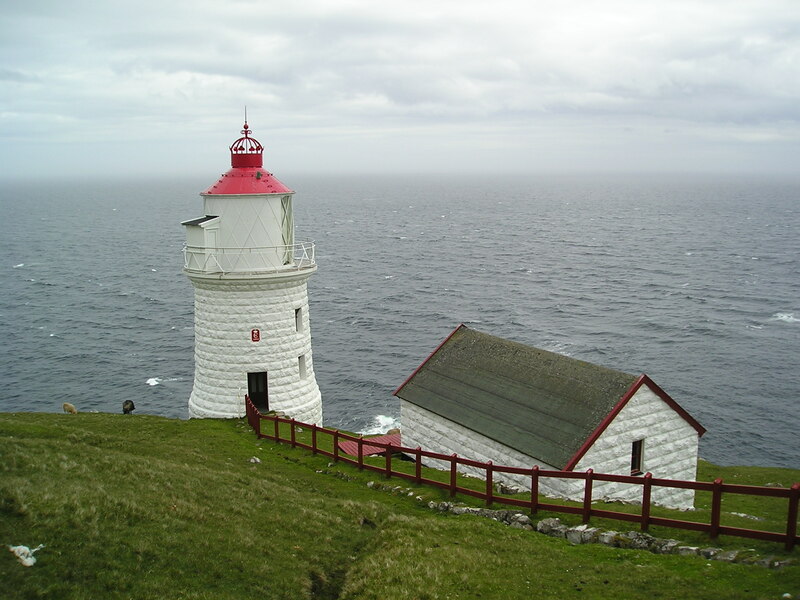 As the sun lowered it started to get quite cold, the daytime temperatures are around 20 degrees but at night it can get down to about 5 degrees or lower, which is in contrast to the Faroes where it seemed to remain fairly mild all night. With Mývatn’s notoriously limited local bus services, I decided to hire a bicycle for the day. I paid 1000ISK for the privilege, but what the hell, I’m on holiday. 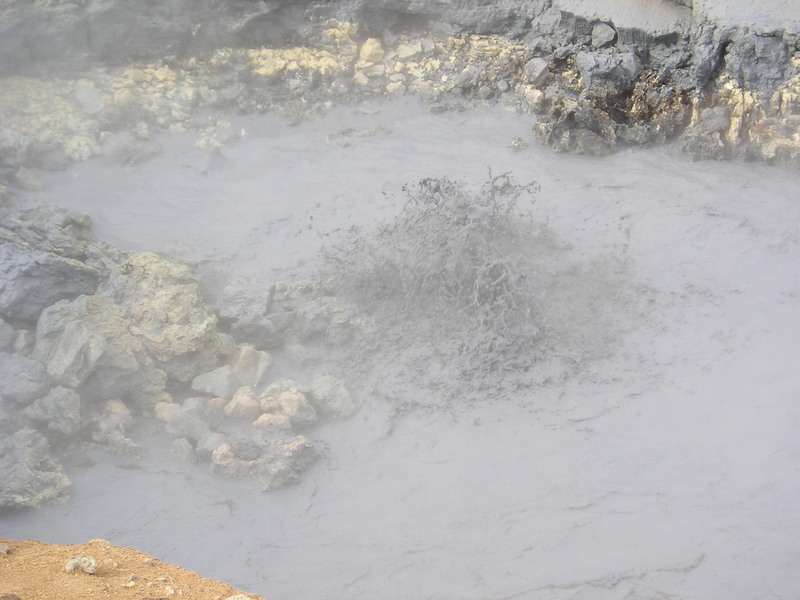 My first stop was Hverarönð, a properly impressive series of steaming vents and boiling mud – far more active than anything I saw yesterday. The vents were absolutely feracious, and pretty loud to boot. 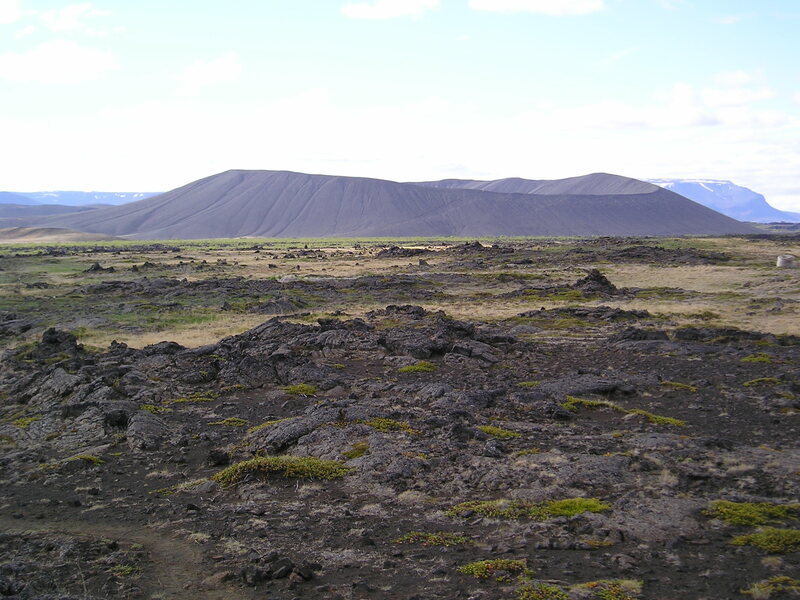 From here it was another few kilometres onto Krafla, a nearby Volcanic area. I was absolutely shattered when I got there – it was pretty hilly, and my legs just weren’t used to cycling having not been on a bike for the best part of a decade. 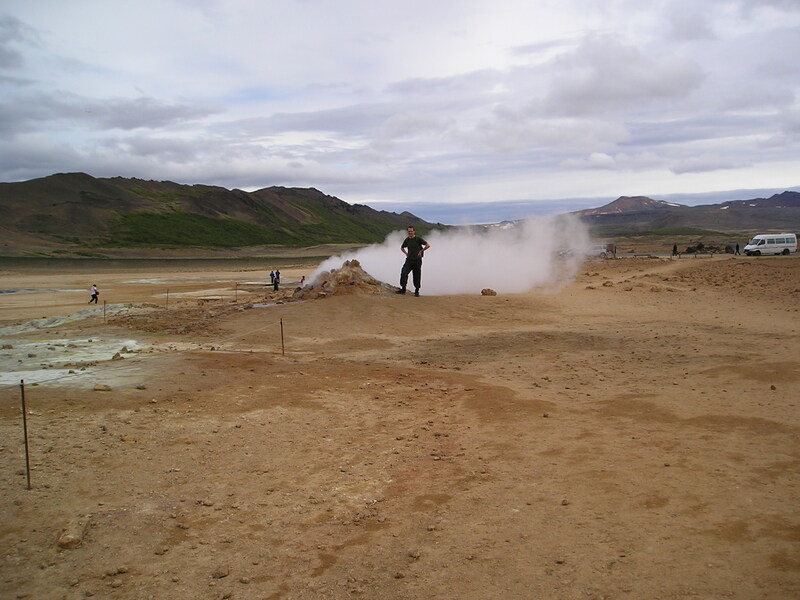 Krafla itself was pretty impressive, although mid way through my third day in Iceland I did wonder if I was already beginning to suffer from Volcano fatigue, once you’ve seen one steaming vent you’ve seen them all perhaps. Keen to avoid the hills I’d encountered on the way here, I decided to take what I thought was a shortcut on a different route, signposted as 13.1km back to Mývatn compared to the 16km I’d cycled to get here. What I hadn’t realised was that a good 10km of this 13 was across lava fields, not exactly ideal cycling terrain and for most of it I was forced to carry my bike, cursing the thing and the 1000Kr I’d spent on hiring it. Only the final few kilometres were in any way easy going, and I passed an interesting looking industrial building which I later found out to be Bjarnarflag diatomite plant, a geothermal power station. I got back to my campsite about 3:30, swearing I’d never ride a bike again. I had a relaxing afternoon writing a few postcards, and I bought my bus ticket to Akureyri tomorrow, although was disappoted to learn it didn’t leave until 3:30 tomorrow, giving me a full morning in Mývatn (lovely as it is I feel I’m done with it after two and bit days). 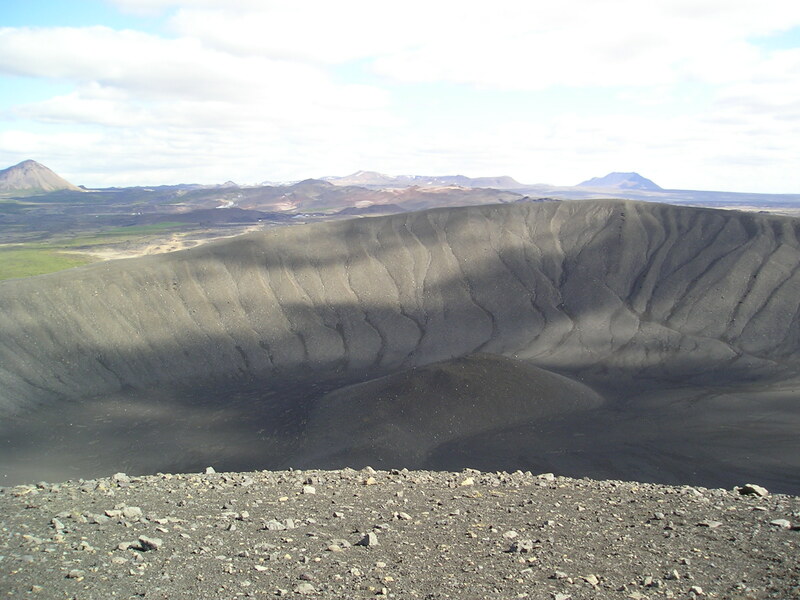 Spurred on by a Danish guy I met last night (at my campsite by Lake Mývatn), who assured me that a return trip walking to the Hverfjall crater could be done in five hours, I set off on the hike early. It’s an interesting walk through lava fields of various ages, the newer ones are just bare rock, the older they are the more vegetation there is that’s started to appear, from mosses to shrubs. 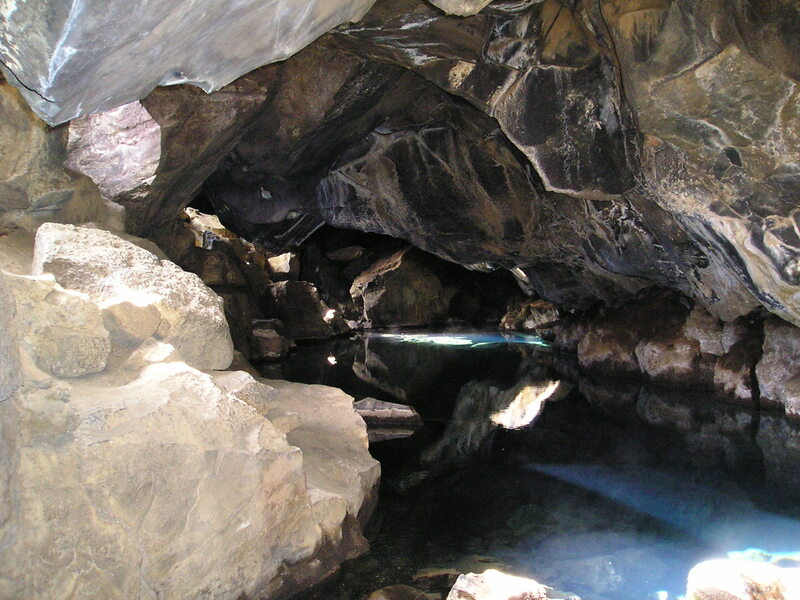 I went past a couple of geothermally heated pools, Grjótagjá and Stóragjá. I was expecting to see masses of steam but they were fairly modest affairs, whilst still impressively warm to the touch, not as visually spectacular as I’d imagined. 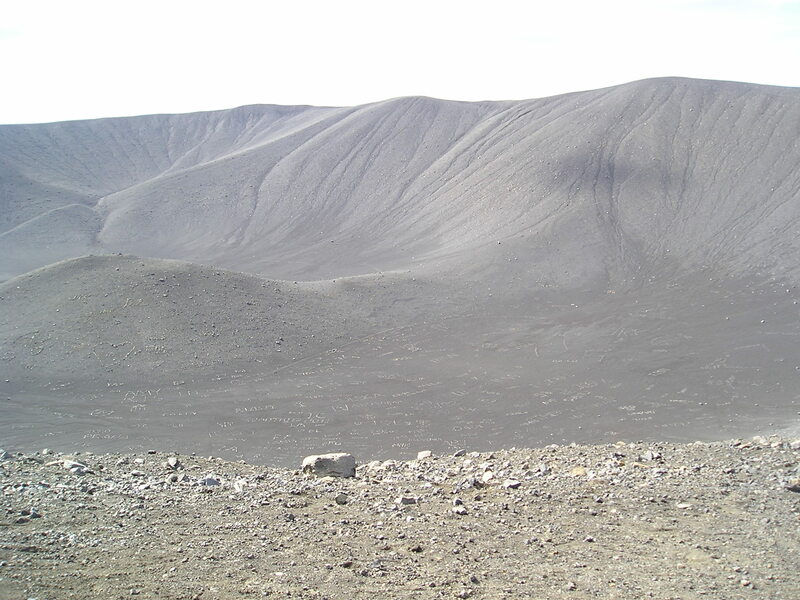 Sure enough about two hours until I reached the base of the Hverfjall crater, and I started the steep climb up. 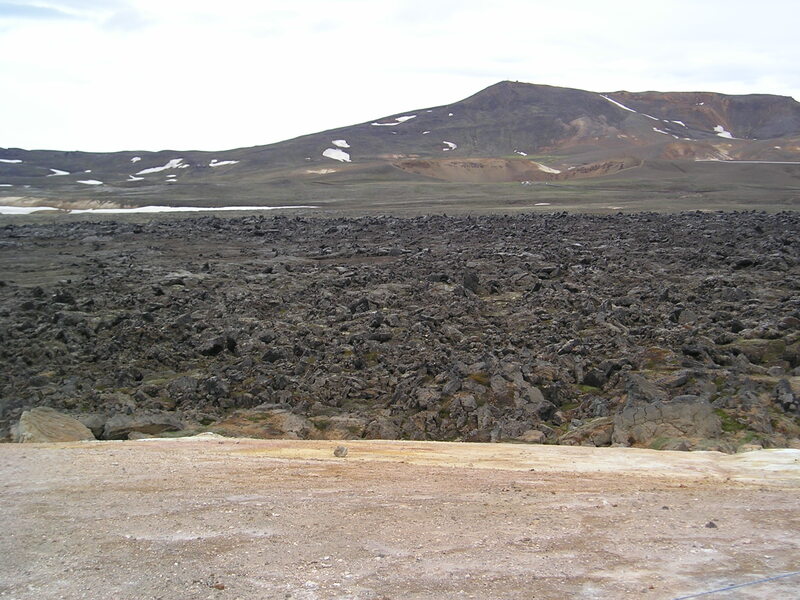 It’s undoubtedly an impressive sight, though the unofficial “Hikers Messageboard” of stones at the base of the crater some what takes away from the experience, it’s all “Gunnar was here” and “Sigmundur 2004”, after hours of not seeing anyone I felt right back at the heart of tourist central. 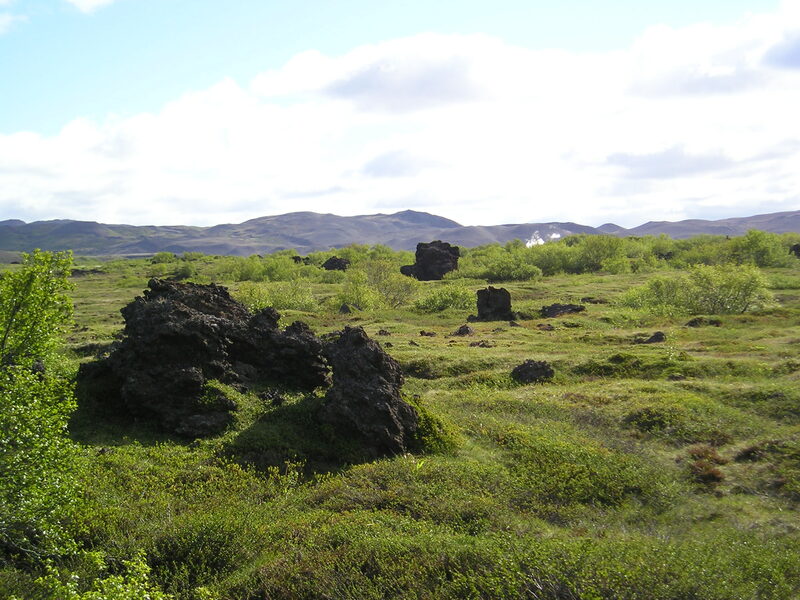 On the way back I took a detour via Dimmuborgir, a network of paths among a lava field full of striking and unusual shapes of lava. 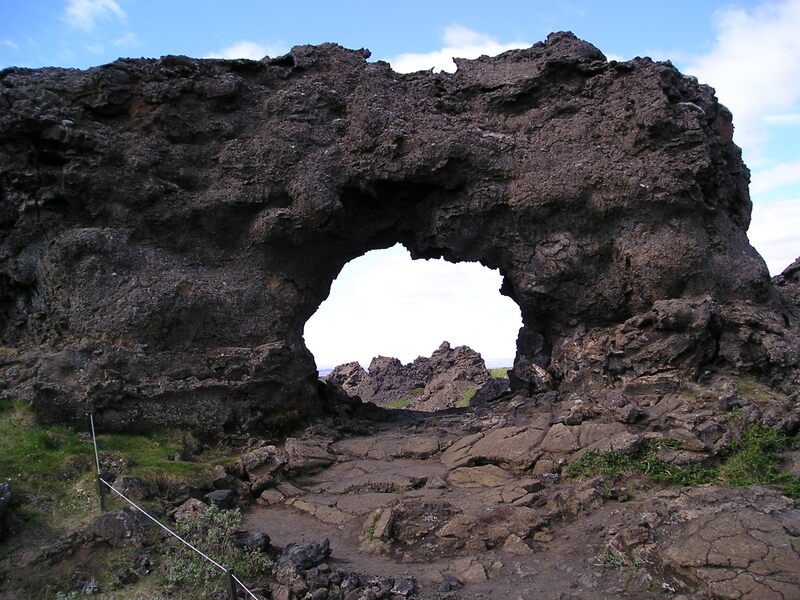 At one point I walked through an lava arch at the top of a hill, to be met by an army of Japanese tourists the other side who all seemed to want to take a picture of me walking through the arch. “You are a hero” one of them told me – all a bit bizarre but quite amusing. I made it back to the campsite almost exactly five hours after setting off – a decent hike and I felt like it’d been a good introduction to Iceland. 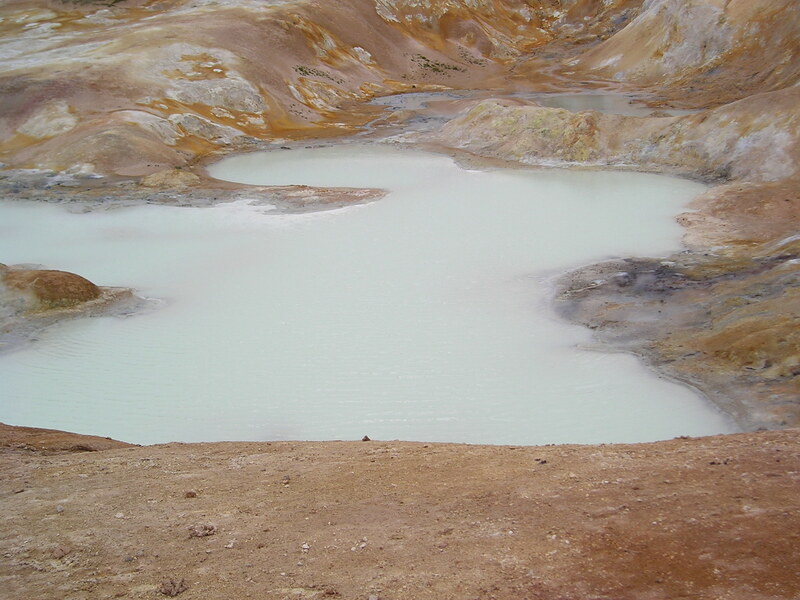 After resting up for a couple of hours I wandered up the road to the Mývatn Nature Baths, a Blue Lagoon style geothermal heated pool. 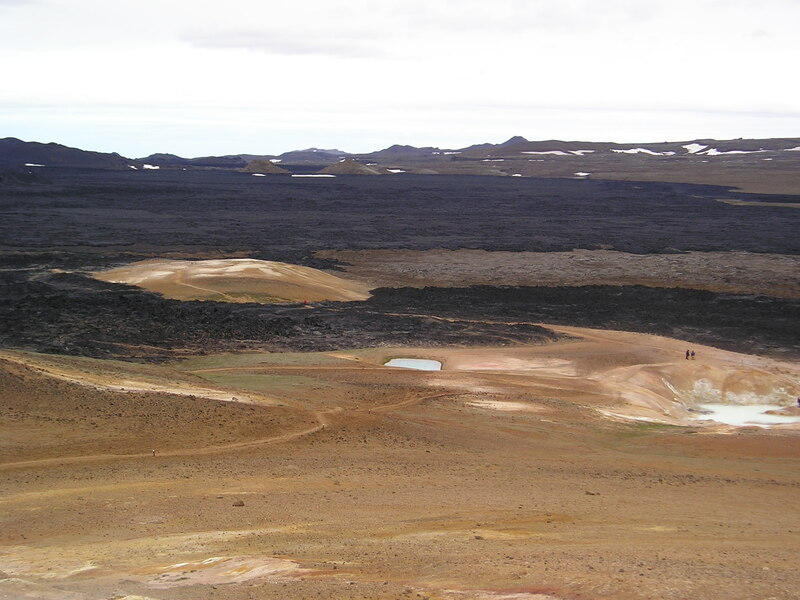 It was stunning – so relaxing to be in a pool looking out over lava fields, with hardly anyone else around. Kind of like having a really big bath in the middle of nowhere. 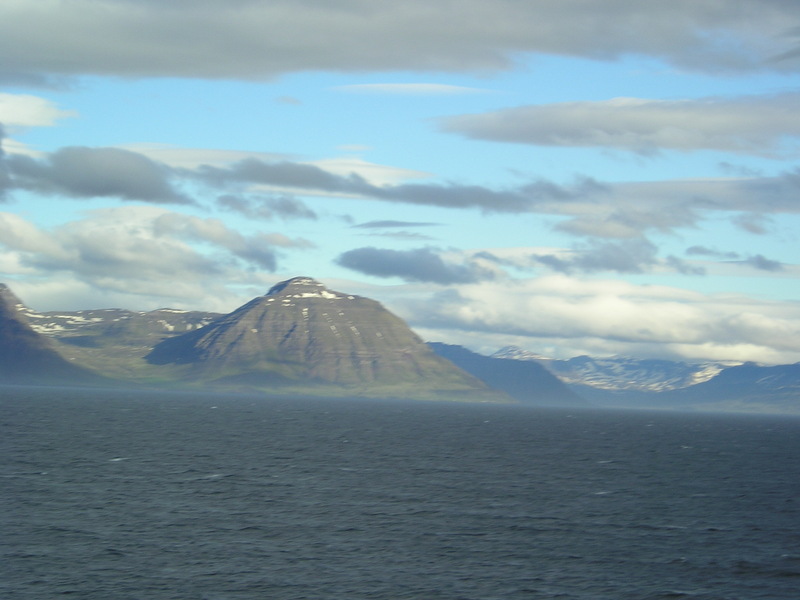 As the snow capped grey mountains of East Iceland come into view on the horizon I reflect on my good fortune at having another incredibly smooth ferry crossing across the North Atlantic. The sky is also completely clear and a magnificent, rich shade of blue, which I haven’t seen for a few days having had a rain end to my week in the Faroes. 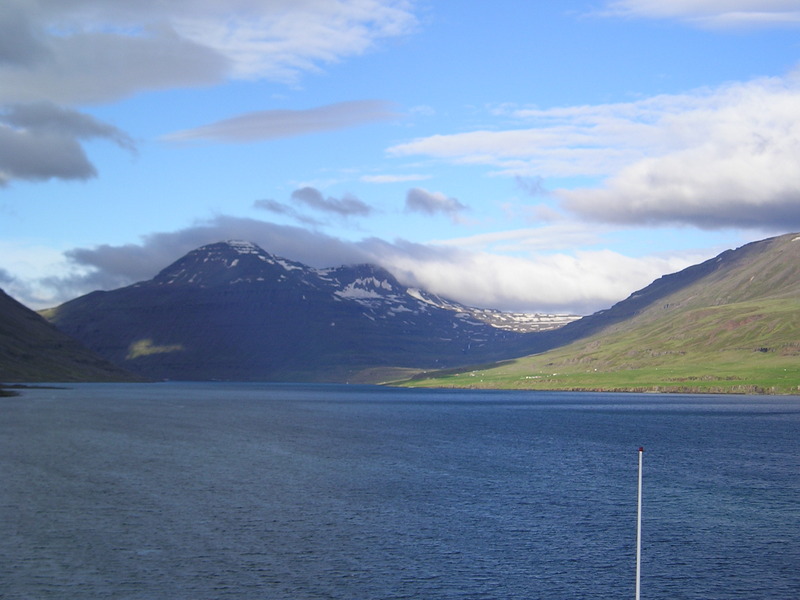 Eventually we entered Seyðisfjörður itself, after travelling down a magnificent fjord. 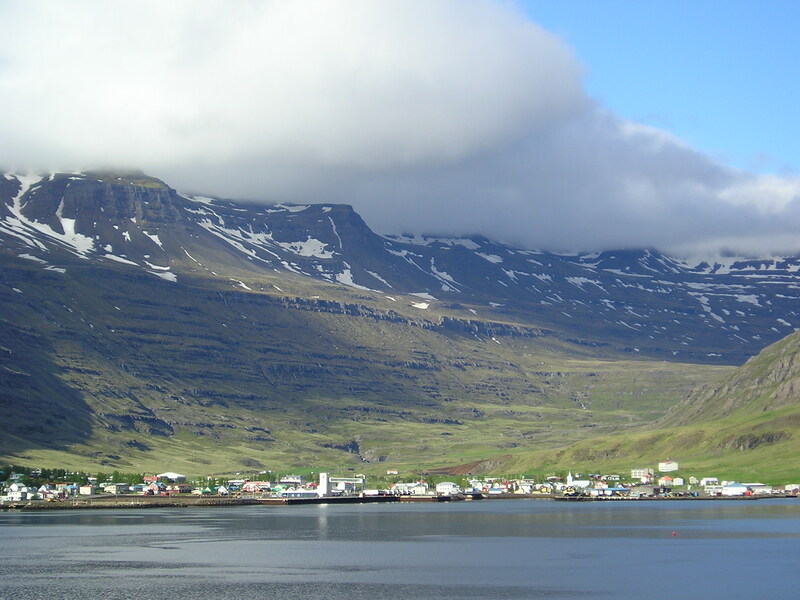 Seyðisfjörður is quite a small town, in some ways not dissimilar from a lot of the Faroese villages I’ve seen over the last week. 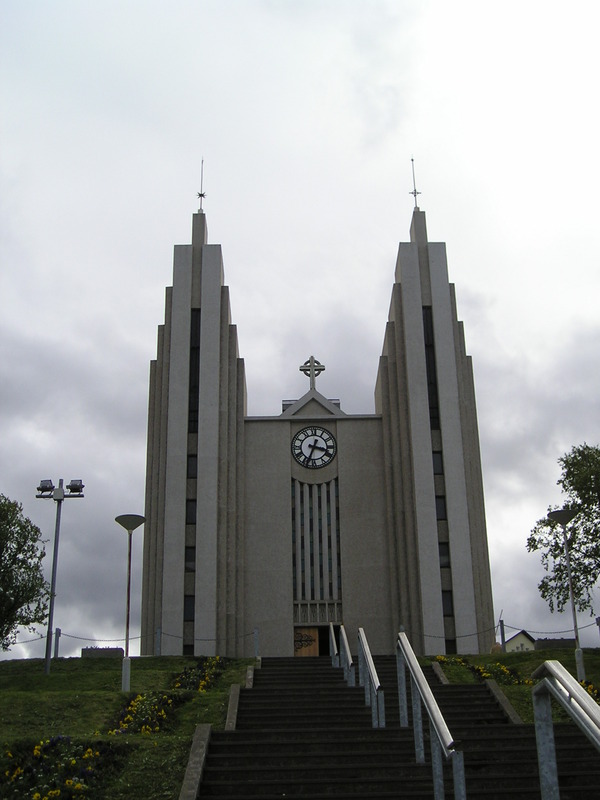 I was given quite a hard time at customs, which I hadn’t expected, was questioned about my itinerary and what I was doing in Iceland and had my luggage searched. Still, as a single young male with a backpack who hadn’t shaved for three days perhaps they thought I was smuggling drugs or something. From Seyðisfjörður I caught the connecting bus to Egilsstaðir. I had several hours here before my next bus to Reykjahlíð – although quickly realised this was going to be more than enough. Despite being billed as the “transport and commercial hub” of East Iceland in my guidebook, there’s really very little to the place. 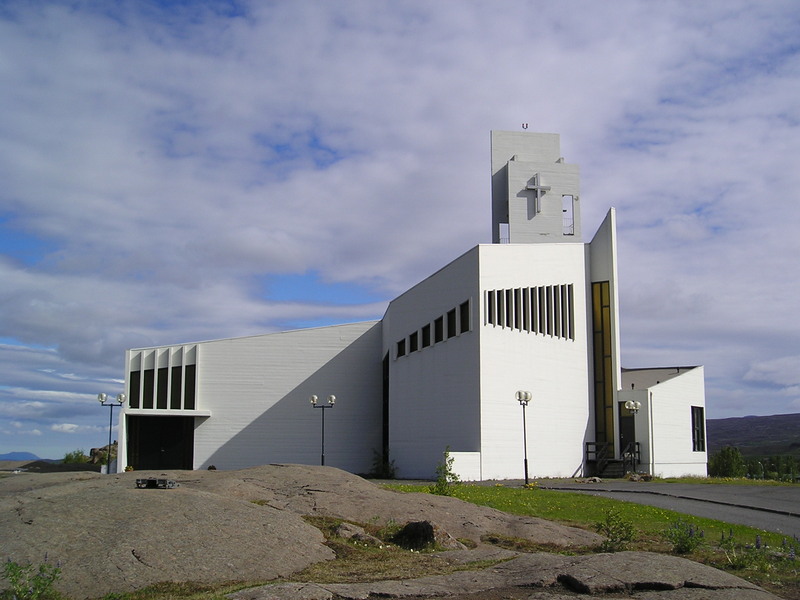 A few facilities (a supermarket and a bank), and a church which I took a quick peek in. It was a glorious day in East Iceland so I headed back to the campsite which is where my bus was leaving from, and sat enjoying the sun for a couple of hours. The bus ride to Reykjahlíð on the shores of Lake Mývatn was incredible, we drove through a real desert looking landscape with patches of thin grass surrounded by vast expenses of barren rock and gravel, with snow capped mountains in the background. The road had yellow posts at the side of the road at 20m intervals, presumably so you can find your way in the winter when they must get a lot of snow here. Despite being “Route 1” which is the main ring road around the edge of Iceland, it was untarmacked in places, and at one point the driver had trouble getting sheep on the road to move out of the way for us. 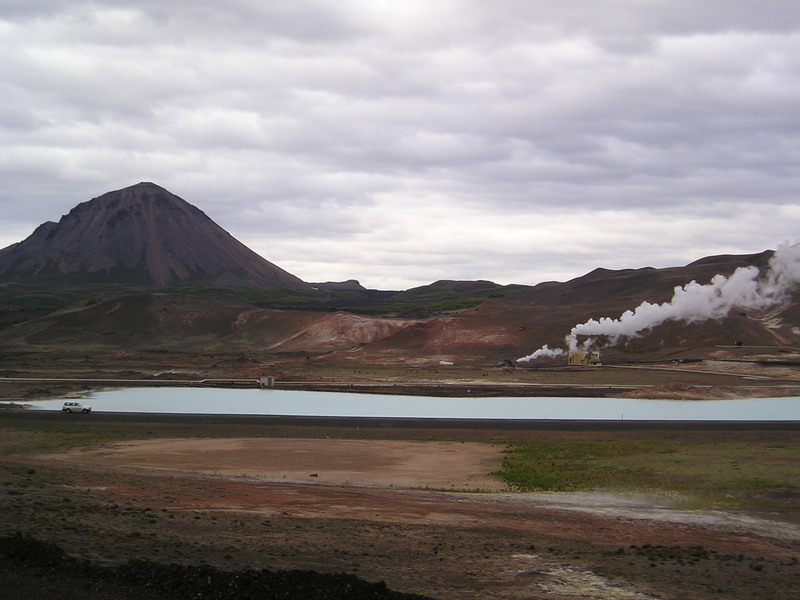 Approaching Mývatn we passed a couple of geysers, quite an amazing sight,and a strong stench of amonia filled the air. After the bus dropped me off I walked to the campsite and was immediately set upon by mosquitoes, Lake Mývatn literally means “Midge Lake” and I can see why. They didn’t seem to be biting, although perhaps tomorrow will tell. I bought a few supplies at the local shop and was horrified by the cost, two tins of tomatoes, a tin of sardines and six breakfast bars cost 900ISK (2012 edit: this was about £8 at the time, before the financial crisis that bankrupted Iceland, the same amount now would be less than £5). Still at least by camping I was keeping the cost down as much as I could.